I have quite a few recipes that I make on a pretty regular basis but for some reason or another, have never blogged. This is one of those recipes. Tom doesn’t like many vegetables so I’m always looking for different recipes for the five or so vegetables that he does eat. 1. Melt the butter in a small saucepan over medium heat. Add the garlic, brown sugar, mustard and salt and stir until combined. Set aside. 2. Fill a large bowl with cold water and ice cubes. Bring a large pot of water to a boil. Add two large handfuls of the green beans to the boiling water and blanch for 2-3 minutes or until they are bright green. Remove the green beans with a slotted spoon and place immediately into the ice water bath. Repeat with remaining green beans until they all have been blanched and cooled. 3. Transfer the green beans to a clean kitchen towel or paper towels. Blot until dry. Empty and dry the bowl of ice water and return the green beans to it. Pour the butter mixture over the green beans, cover with plastic wrap and refrigerate at least 4 hours. 4. Preheat the oven to 375. Grease a baking sheet or casserole dish. 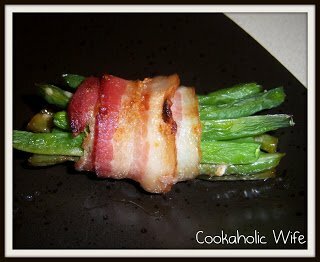 Gather 8 or so green beans and wrap a slice of the bacon around them. Secure with a toothpick if necessary. Place the bundle bacon seam side down on the baking sheet or casserole dish. Repeat with remaining green beans. Pour any remaining marinade over green beans. 5. Bake for 45 minutes or until the bacon is cooked through and the beans are slightly wrinkled. Change the oven to broil and broil for 1-2 minutes or until the bacon is crisp. Yum! I have a hard time just eating one bundle of these! I made them on Christmas when everyone was here and they were one of the first things to go.